These are very good and they make exactly 12 muffins---but only if you use "Texas-sized" muffin pans. I subbed canola oil for the butter and buttermilk for the milk and piped my homemade raspberry preserves in the top. So pretty! Moist and sweet muffins. This recipe uses a 3:1 flour:corn ratio, as a result the texture is not as gritty as many corn muffins. These were easy to prepare, but I did run into some problems. It makes a lot of batter. Ina Garten says to fill to the top of 12 muffin cups, so I just piled in the batter. Way too much - the entire top cooked together (see my picture #2). This made removing the muffins problematic, and only 7/12 came out intact. I did pipe preserves into the muffins. 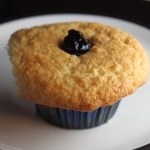 It worked fine - very nice way to serve the muffins without having to give everyone a knife and have jam on the table. They were still crumbly, and the dog happily licked up all the crumbs that hit the floor. While these were delicious, they use A LOT of butter and sugar - 1 C each. This is not the way I typically bake. Given that this recipe was developed for the Barefoot Contessa store, its great, and I could see it being loved by many. But it confirms my suspicion about buying muffins! Did not add the raspberry preserves because I just wanted to make a corn muffin and these were very good. Need to cut the recipe in half next time because the full recipe made 17 muffins.